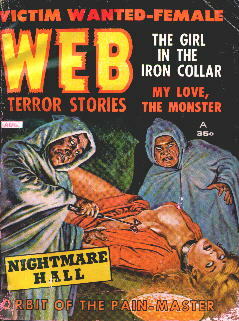 PULP COVER FRIDAY PRESENTS THE MOST SCHIZOPHRENIC MAGAZINE EVER! 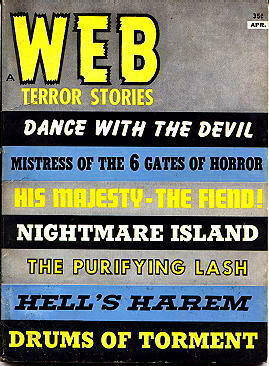 It’s not unusual for a magazine to change it’s title, or even its editorial slant, or sometimes even its genre. 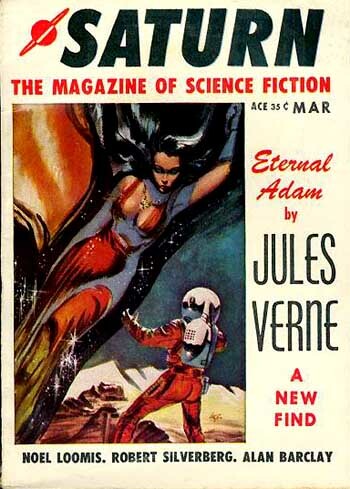 Though technically it was a digest rather than a pulp (smaller sized, trimmed paper edges, and published outside of what is generally considered to be the pulp era, which basically ended in the early 1950s) this zine began its life as SATURN: THE MAGAZINE OF SCIENCE FICTION (March 1957). Normal enough. 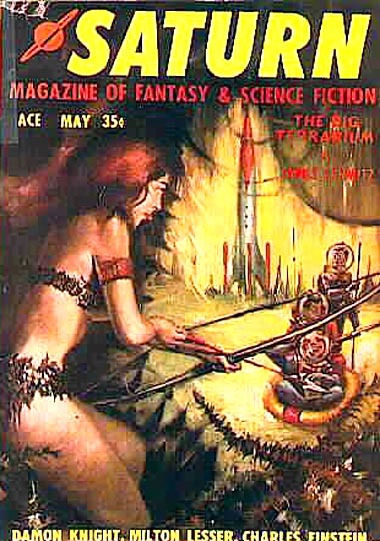 Perhaps feeling a little bound by its title, however, the very next issue saw an expansion of its subject matter as SATURN, MAGAZINE OF FANTASY AND SCIENCE FICTION. Not a big change, though perhaps a little unweildy. 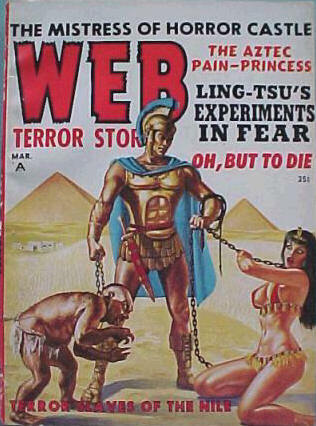 So, the next issue (#3) it became SATURN SCIENCE FICTION AND FANTASY, emphasing SCIENCE FICTION over FANTASY. (But where’s the love for Mars and Venus, etc, etc, etc?). The title stuck for issue 4, whose cover I’m showing because it’s better. Issue #5, ditto. 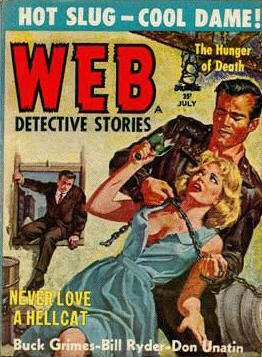 But with #6 (8-58), it becomes SATURN MAGAZINE OF WEB DETECTIVE STORIES. What the hell? Does that even make sense? Whatever the reason — spacemen are out and gumshoes are in. So, after a couple of more issues I can see them sitting around the office, saying, “Why do we have SATURN in the title? I mean, none of the stories are set on Saturn. No one ever even mentions Saturn. So why is it on our cover?” No one knows. 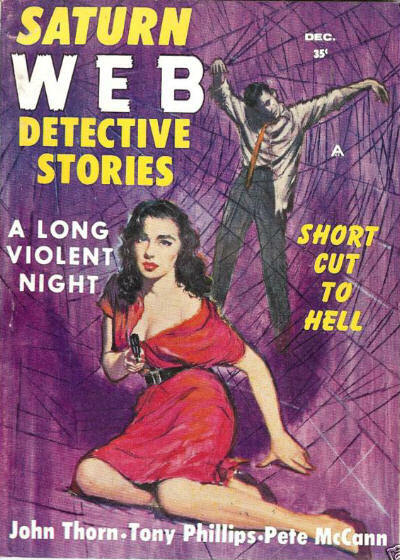 And so, WEB DETECTIVE STORIES is born. 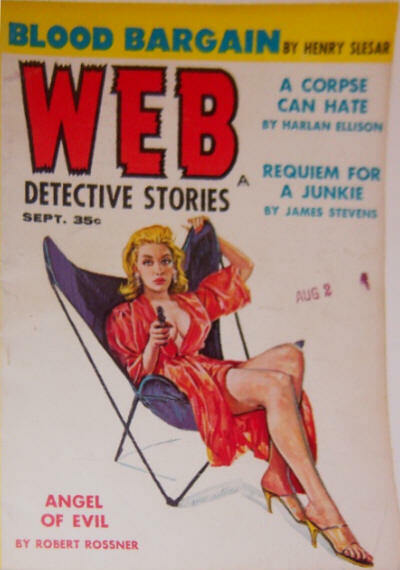 But all good things come to an end, and WEB DETECTIVE STORIES came to an end after ten issues. 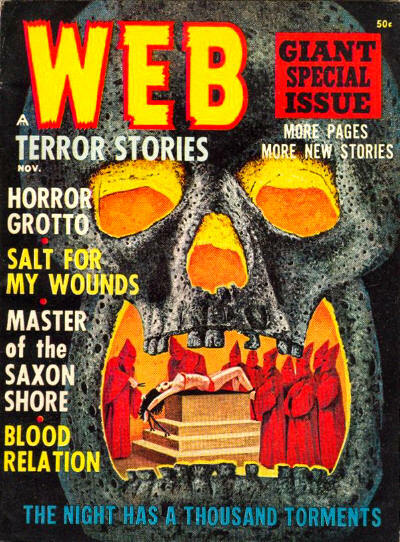 Almost a year went by, and then, phoenix-like from the ashes of its predecessor arose WEB TERROR STORIES (8-62), a weird menace zine, when the weird menace genre had been virtually extinct for lo these many years. 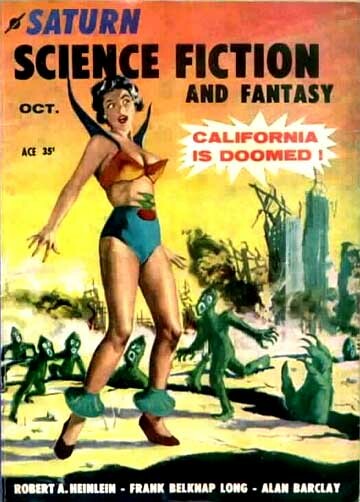 Oddly enough, the first couple of issues have a number of stories by well known sf writers such as John Jakes and noted feminist (I am being perfectly serious here) Marion Zimmer Bradley. After that, though, they either discovered the embarrassed authors’ standby (the pseudonym) or the editor hired a stable of unknowns. (I’m betting on the former.) Below is probably the best cover from this 8 issue run. This is how you know that they’re not even trying anymore. 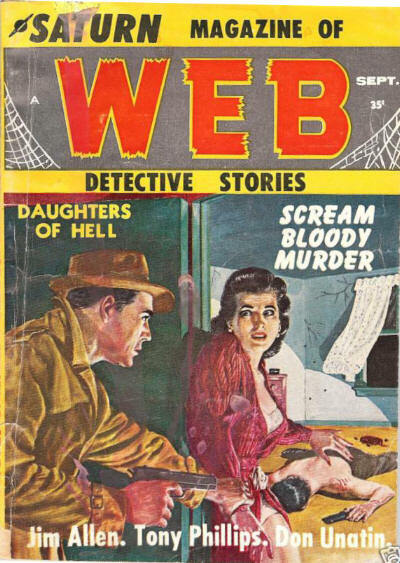 This issue saw the return of the red-robed cultists, but, alas, even this favorite meme couldn’t save the magazine, which was to last only one more issue.